What if I were to tell you that 73% of the content posted to the Internet was fiction, that in the past ten years the number of verifiable facts within web pages had dropped by 48%, and that the vast majority of content was now being produced by trained squirrels in Tanzania? Hopefully, you would realise that these are all pretty good examples of fake news - one of the biggest threats facing the Western World today (according to some commentators). It varies from the almost believable to the absolute absurd, but has one thing in common: it bears little resemblance to the truth. Fake news has become one of the hottest topics in recent years as revelations about election meddling through social media have come to light. Here in the UK researchers uncovered huge bot networks operating via twitter, with clusters of up to 500,000 accounts that operated in coordinated action to undertake sharing and engagement processes. We live in an age where The Washington Post is tracking the President of the United States of America’s false claims, cataloguing a staggering total of 4,229 as of August 2018 – an average of 7.6 claims per day. Facebook - which has been slow to respond to every one of the many crises it has faced recently - has set up a ‘war room’ to combat fake news. With increasing numbers of people turning to social media for their news, and standards of traditional journalism dropping to an all-time low, fake news has become an ever-present factor in real life. But how does this affect B2B marketers and content producers? Well, news is content, and if that content is losing its authority, if it affects people’s trust, then it will inevitably affect how people view marketing messages and content. You also need to remember that if you are posting on social media, your content may appear right alongside untrusted or dubious material. So how can you establish trust and authority in an age where your audience is disillusioned and cynical? There is no quicker way to lose the trust of a prospect or a customer than to be found out lying or stretching the truth. A report by Morning Consult showed that 71% of respondents said that they would feel much less favourable about an online brand if it was found to have lied to customers and did so in order to increase profit. This should really be the starting point for all your content, you will not establish authority and gain that all-important-for-business commodity – trust – if you are not honest and truthful in your content and dealings. Ultimately, the way employees and managers behave is down to the culture and ethos of the business. Have honesty and truthfulness at the heart of the company’s DNA and that will shine through every aspect of the company’s business, right down to marketing and the day to day interactions with prospects and customers. Customers are becoming reluctant to hand over their personal information and data to just anyone. A study conducted by Frost & Sullivan for CA Technologies showed that less than half of UK consumers (46%) are willing to exchange personal data for free or discounted services. That level of trust is among the lowest of any country in Europe and the rest of the world. What is perhaps more worrying is that senior UK cybersecurity professionals and business executives believe customer trust is far higher than it actually is. You should be ethical with the way you collect and use customer data. You should also ensure you keep that data secure. Data breaches can cause a massive loss of trust and therefore sales and revenue. The GDPR regulations may seem like a pain but adhering to them are an important factor in the public’s trust in your operations. Recent research seems to show that the implementation of GDPR is actually restoring the trust people have in companies’ use of data and increasing their willingness to subscribe to newsletters. Two years ago, Michael Gove famously remarked during the Brexit campaign that “people in this country have had enough of experts”. Whether that was true or simply more fake news, recent statistics have shown a marked increase in the standing of experts. This year’s Trust Barometer findings showed an 8% increase in trust in financial experts a 13% increase in the standing of journalists and a 14% increase for company CEOs. One of the obvious reasons your experts will be trusted more than other content creators in your company is that they know what they are talking about. That simple fact means they are less likely to need to embellish, makeup facts or inadvertently give false information. So, make the best of the people in your company who have the knowledge – give them a voice by enabling them to create useful content. Identify them as experts and turn them into ambassadors for the business. Employees too can become powerful and trusted content providers. Research has shown that content shared by employees receives 8x more engagement than content shared by brand channels. If you can publish content that is genuinely useful and helpful to your target audience, then not surprisingly they will start to trust you. Provide unbiased overviews of the market and the potential solutions they are investigating, and you will begin to establish authority. Fake news is not useful, not helpful and cannot be acted upon, so publishing solid information that your prospects and customers can use in their own situations will be valued and remembered. Within a climate of fake news, real facts can be hard to come by. By publishing well-researched, authoritative white papers on appropriate topics you can offer content that will be eagerly consumed by researching buyers. But perhaps the authorities that B2B buyers trust the most are their peers. People in the same situation as them. People who are seen to be independent. And this is why case studies are still seen as one of the most powerful types of content you can produce. Sceptical buyers can learn about others who were in the situation they find themselves in and see how they used your solutions to solve the issues they face. A good, comprehensive case study, in the customer’s own voice, is a compelling piece of content that is seen as more trustworthy by buyers. If you can’t produce a full case study, then interviews with customers – especially videos – are a quick and easy way to show you have your customer’s trust, which will help to establish you are worthy of a prospect’s trust. 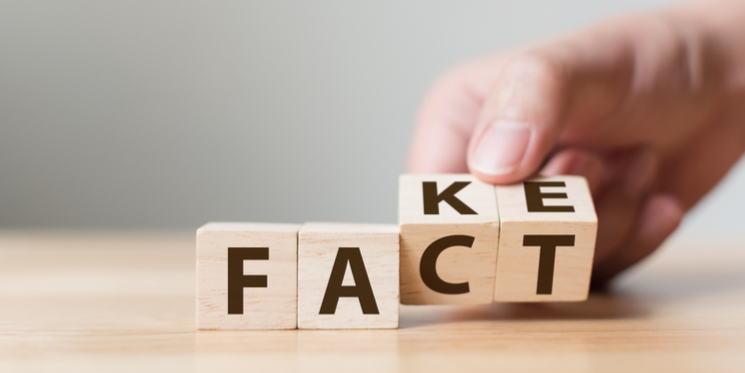 Although phoney facts and disinformation may seem to be it making harder for companies to be trusted, the opposite may actually be true. As long as you can be honest and truthful in your approach and provide content that’s valued by your audience, you can stand out from the fake news in the background.